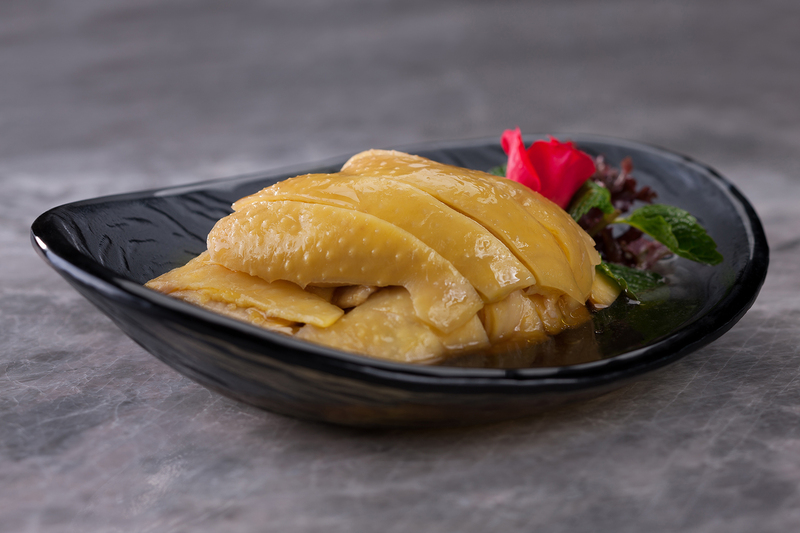 Famous for its tender meat, the wild Subei chicken is slow-cooked and then soaked in a seasoned sauce made with 15-year aged Huadiao wine for two nights to ensure a long-lasting taste on the palate. 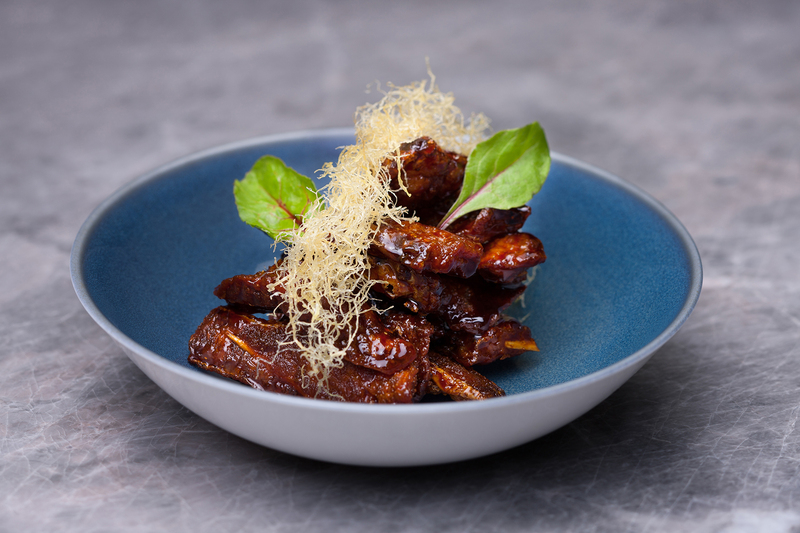 Marinated with five spice powder, ginger, garlic, Shaoxing rice wine, rock sugar, black vinegar overnight, the flavorful sea bass that weighs 3 – 4 catties is deep-fried and then glazed with sweet and sour sauce made with sugar, black vinegar and ginger. The river prawns are deep-fried for 30 seconds and then stir-fried. Repeat this process three times in a row to create a crispy texture. 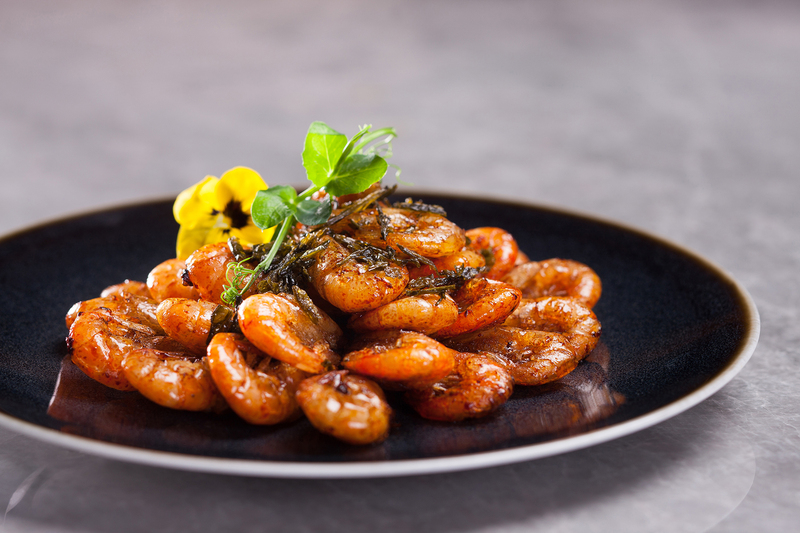 The prawns are then sautéed with a thick Longjing tea sauce for a tantalizing taste. 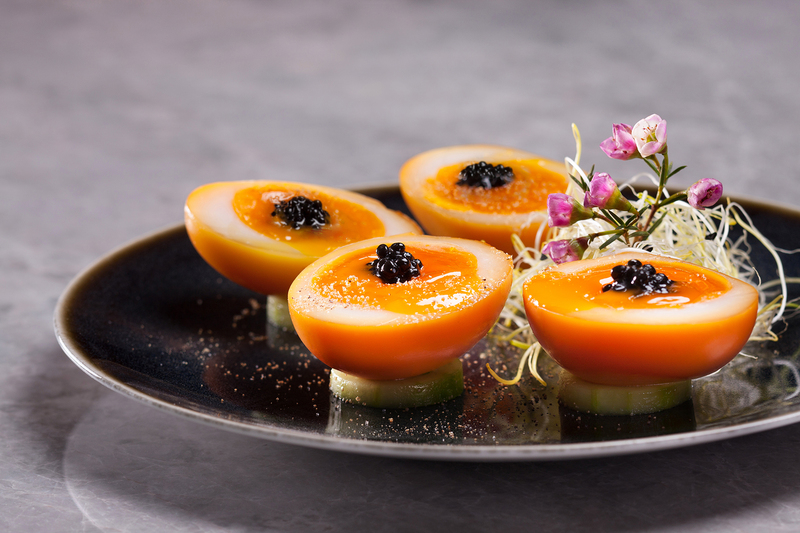 This refreshing appetizer showcases the chef’s expertly craftsmanship. The top part of a cucumber is finely sliced into thin peels while the bottom part is kept as a whole. Whet your appetite with the special dressing made with soy sauce, rock sugar and sesame oil which complements well with the crunchy cucumber. Brought to a boil for 5 minutes and then soaked in iced water, the soft-boiled duck eggs are peeled and smoked over a mixture of sugar and Longjing tea leaves for 1.5 minutes to create an aromatic smoky flavor. The final touch of the Italian black truffle pearls surely makes it a gourmet treat. 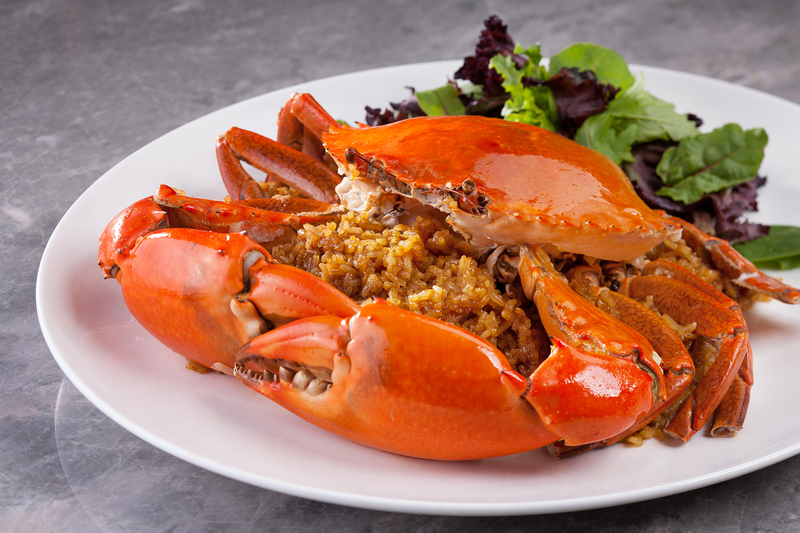 Weighing one and a half catty, the meaty mudcrab is first fried in ginger juice for its fragrance, and then along with the half-cooked glutinous rice until the flavor of the crab fully penetrates. 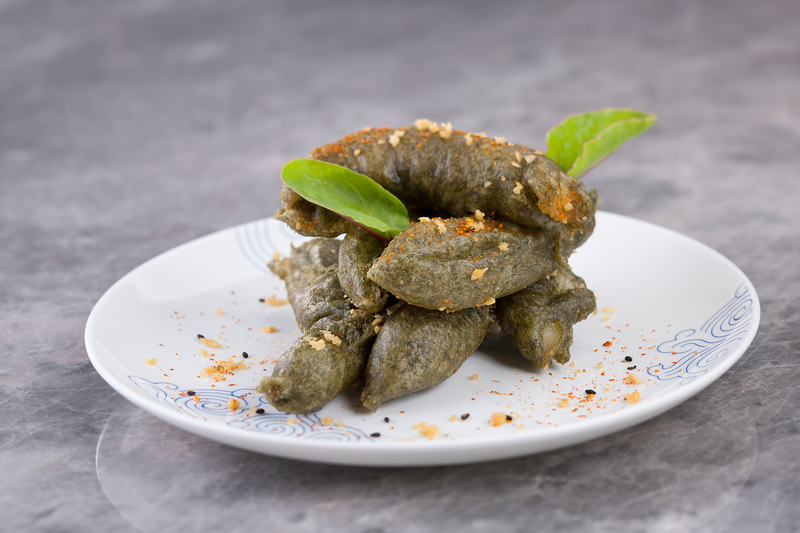 Both cultivated in Zhoushan, the aromatic seaweed and yellow croakers are a match made in heaven. Dip the deboned fish into the batter mixed with seaweed powder and deep-fry until crisp and golden. 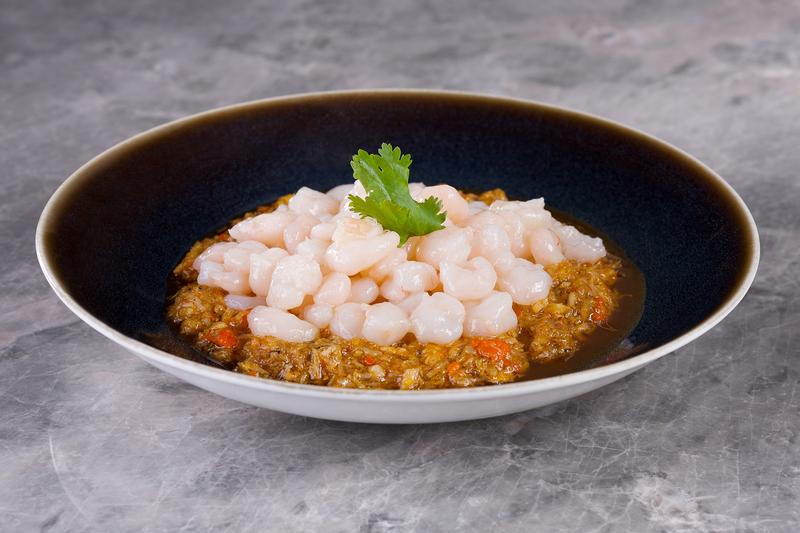 Small Jiangsu river shrimps are peeled and sauteed with Shanghai Hairy Crab meat and roe, resulting in a golden coating layer as well as a pleasantly rich and creamy taste. 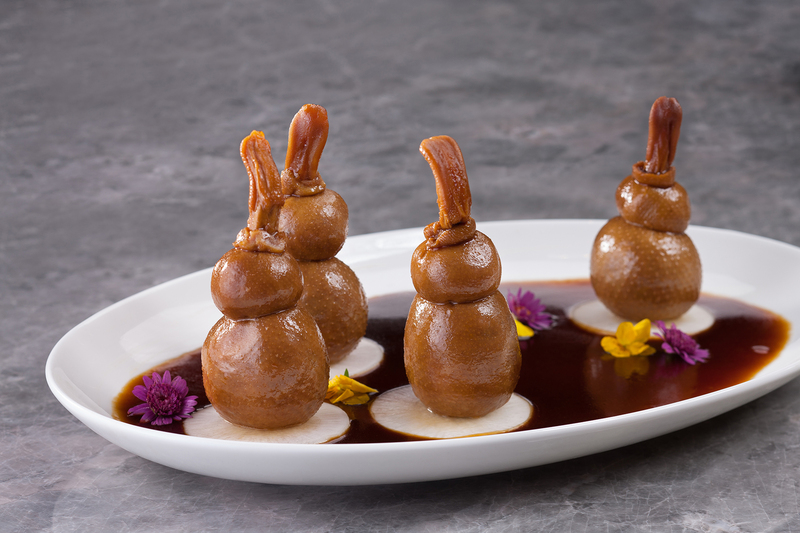 This exquisite dish demonstrates the chef’s creative take on a traditional recipe. Diced duck, chicken, lotus seed, conpoy, shrimps, pork tripe, mushroom and glutinous rice are sautéed together and wrapped with duck skin. Make it in a perfect calabash shape with a string and place a duck tongue on top. Steam for 20 minutes and serve. The marinated chicken is pre-cooked in a soup base, followed by an air-drying process with maltose syrup and smoking for 30 minutes to add a smoky flavour. 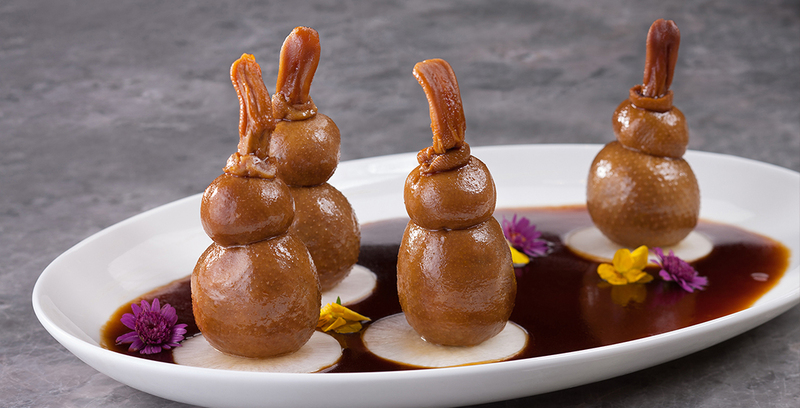 This spectacular dish arrives under a glass dome filled with smoke infused with lychee wood. When the dome is lifted, the fragrant smoke raises, making it a feast for both the eyes and the nose. 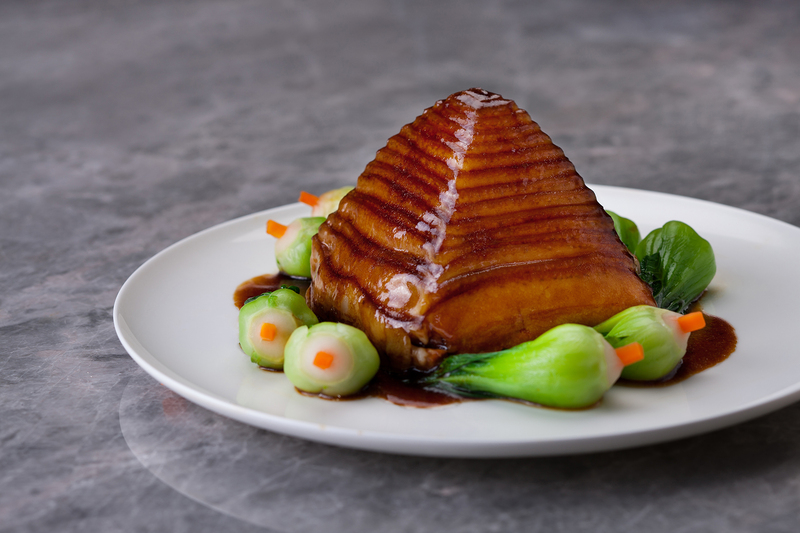 Marinated with rice wine, cassia, black cardamom and herb sauce, the roasted pork belly is braised for 30 minutes in low heat, and then delicately sliced into 2-3mm. 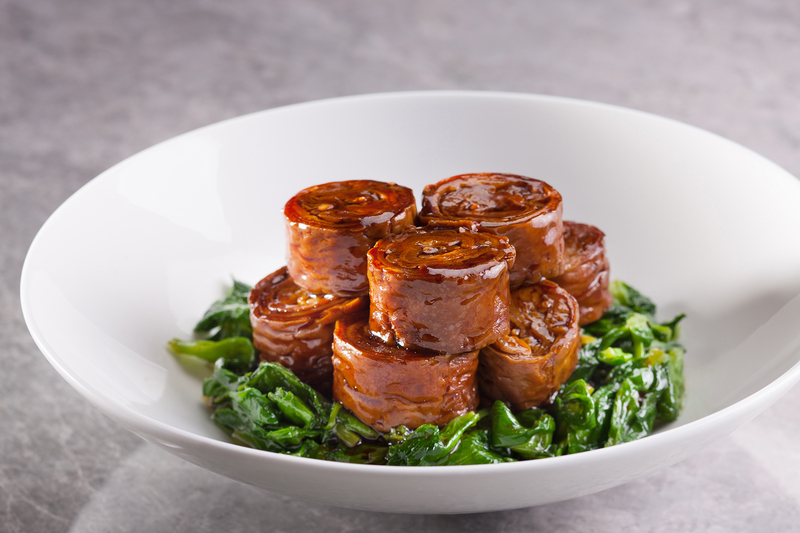 The layers of pork are piled up like a pagoda, which is then served with dried preserved vegetables for an ultimate authentic taste. 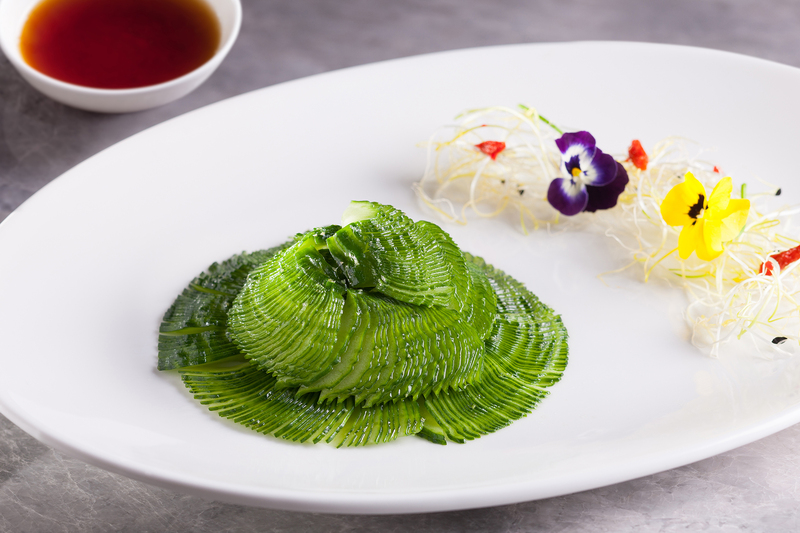 Pork intestines are braised with scallion, ginger and rock sugar, then cut into round pieces and finally decorated with seasonal green vegetables. 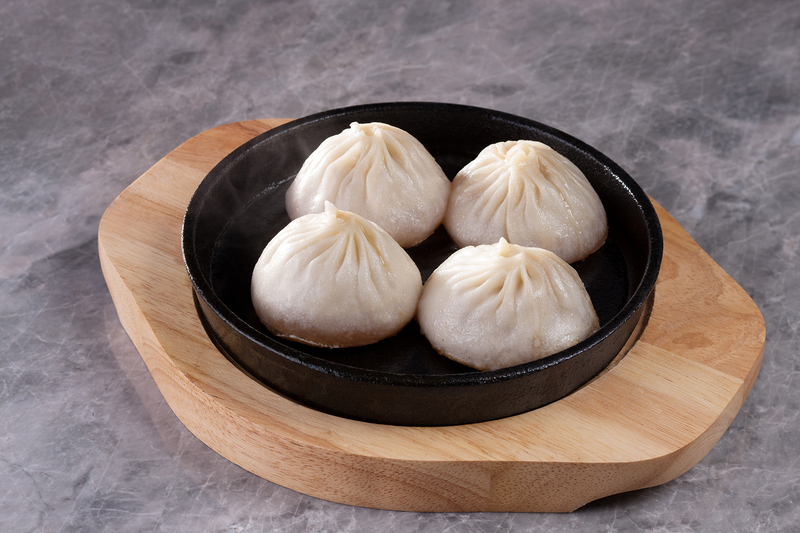 Served in a cooking pan, the sizzling hot Xiao Long Bao has evolved from its traditional version with its crispy bottom and hot and succulent meat and soup, elevating the entire culinary experience to another level.